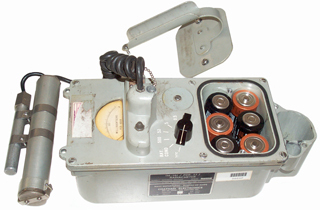 This Giger-Muller set started out as the PDR-27A which was a tube type set using three different batteries and progressing to an all solid state unit using common "D" flashlight batteries. The PDR-27J set comes in a metal carry case that's 18 5/8" long x 7" wide x 9" high. 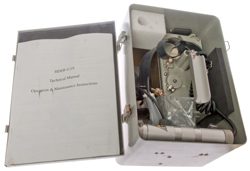 The top can be removed to access the contents and has a compartment inside the lid of which contains a paper titled "Maintenance Procedures". Inside the box there's the PDR-27J, the ST-136/PDR-27 carry strap, H-43B/U headphones with a BNC-m connector on the cord. There are 4 holes in the foam end part of the box to hold something (test sources and/or spare G-M tubes). The HDER G-01(PDR-27S) comes in a case that's 12-1/2" hi x 8-7/8" w x 7-1/8" dp. Ranges of 500, 50, 5, 0.5 milli R/hour. Note a 100R dose will make you sick and 500R is fatal. 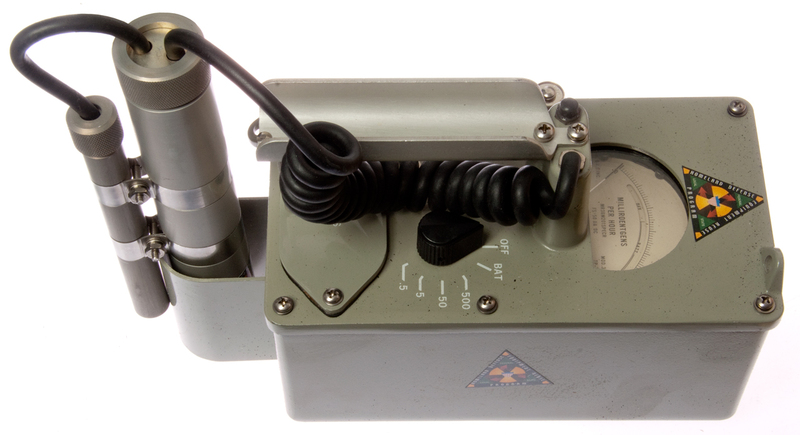 The PDR-27J runs from six "D" flashlight batteries. The photo at the top of this page shows the handle-battery cover removed (3 captured screws) and the batteries installed properly. Note: at the bottom of the battery compartment each battery position is labeled either "positive" or "negative" (referring to the end of the battery that touches the bottom of the box. Turing the switch to the first position "BAT COND" causes a meter scale to rotate into view with the word "b a t t e r y" and a high and low limit mark to come into view. In my case the needle goes to about the center of the range. The probe is made up of two separate GM tubes. V101 is a JAN5980 in the 5/8" dia x 5" housing. This small tube is used for the 500 and 50 MR/hour ranges. The dead time for the 5980 tube is 45 micro seconds. 3.5 gamma cps/ mR/hr. 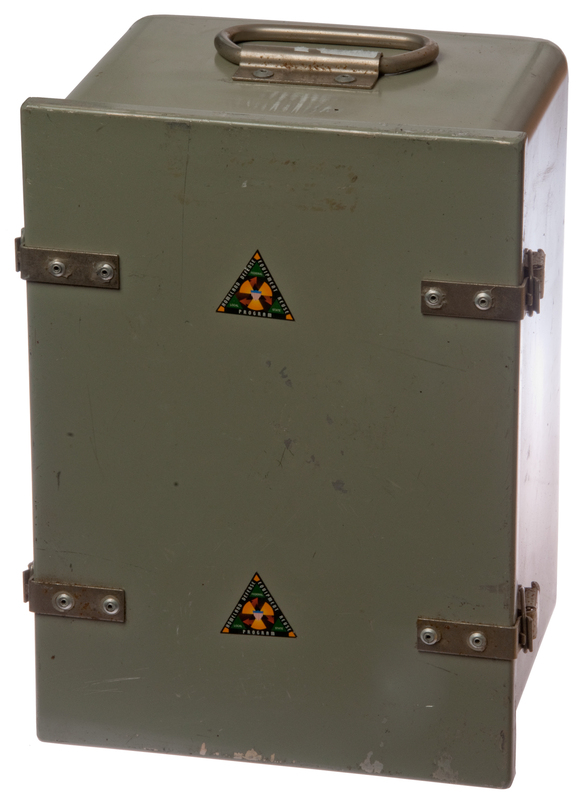 V102 is a JAN5979 in the 1 1/4" dia x 7 1/2" housing with the hinged end cap which when opened allows alpha particles to be counted. Both tubes are connected in parallel for the 5 and 0.5 MR/hour ranges. The dead time for the large 5979 tube is 100 micro seconds. 45 gamma cps/ mR/hr. The probe is permanently attached to the coiled cord and the cord is permanently attached to the housing. switch is the cover for the 4 range calibration pots. Page created 17 Jan 2006.